The Hubbard Bath is used for therapeutic, underwater, whirling massage of the whole human body or its parts. Hydrotherapy bathtub specifically designed for use in a pediatric environment. Two massage areas, with 24+10 massage water jets. 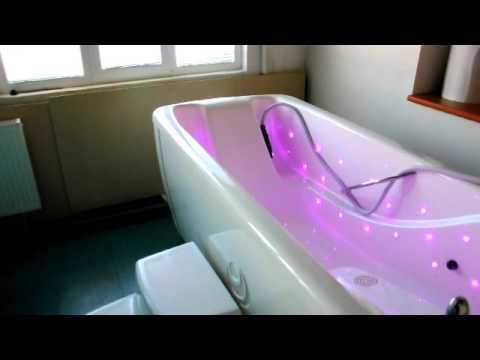 Hydrotherapy bath tub with intelligent funcions. Controlled by a computer via a touch screen for selection of the individual functions. Tub with jet nozzle and support. Pressure and air mixture to the nozzle jet are constantly adjusted. Hydromassage bath tub with 24 massage jets, used for massaging the whole body as well as specific targeted areas. Hydromassage bath tub with 40 massage jets. Adjustable water jets performance , used for massaging the whole body as well as specific targeted areas. Artificial air bubbles come out in the whirlpool generating flows of water that massage the whole body. There are cases in which, for some reason, the manual massage is contraindicated. The water massage can replace it by massaging the whole body. Hydrotherapy is the use of water for the prevention and cure of illnesses. Already the Romans employed water not only for bathing, relax and fun but also for medical treatments. Medical treatments can be done in baths filled with healing substances or thermal water. Water is used also for thermic effects. Cold water stimulates blood circulation of inner organs, inhibits inflammations and has a reinvigoration effect. Hot water stimulates blood circulation of skin and muscles and has a relaxing effect. A better blood circulation strengthens the immunisier system, helps the lymphatic draining.